Steve wanted a very simple, elegant, but memorable card. We decided that URL and phone number was the only essential information to simplify the amount of type. The branding was carried out with a die cut that allowed Steve's logo to take on the surface characteristics of whatever the card was set on, contrasted against the white face of the information side of the card. 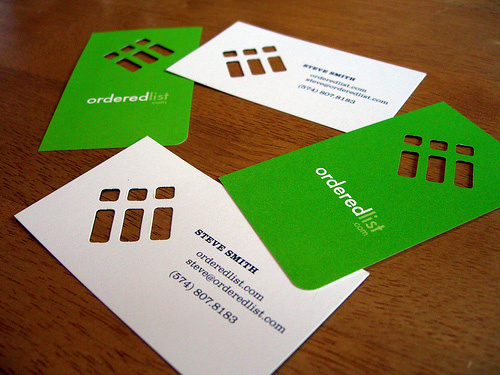 The orderedlist.com text on the back is positioned so that the card is read horizontally on the information side and vertically on the green side. In this manner the logo always 'reads' properly, with the set of three smaller elements up and to the left.